New update of Rampage Knights was just released on Steam. The release date is quickly approaching. We keep polishing and fixing many aspects of the game. This update focuses mostly on adding more variability to the first forest level. There’s also a ton of little adjustments and fixes. Shops can contain armors, belts, potions and scrolls now. Added one more shop to Gothic level. Now there are at least three shops per run. 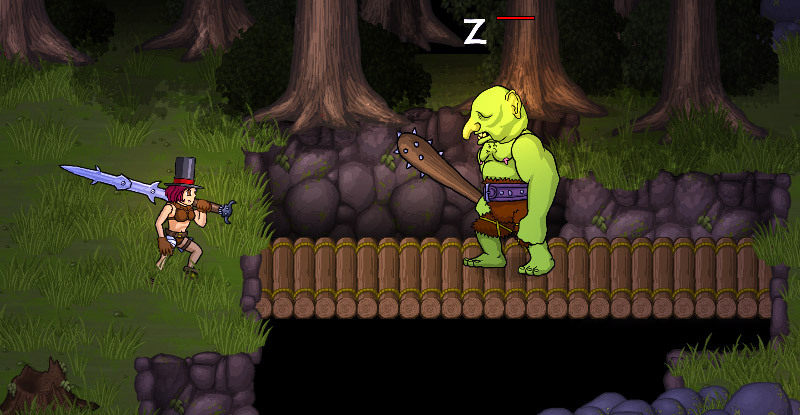 Added new rooms that can spawn in the Forest: “troll” bridge, rooms with pits, rocky ledge and rooms with long grass. Forest Den in the forest is always on the path to the exit so it cannot be missed. A fence was added to Graveyard rooms to make them more distinctive. New Iron Maiden treasure room can spawn in the castle. There are more rooms with pits and spikes in the castle. Elven Armor was changed. It gives immunity to poison and diseases. Hit counter does not increment when a player hits for 0 dmg. Hitting enemies with shields no longer builds the hit counter up. Achievement Whip It Good cannot be cheated by hitting enemies with shield or the Slime Head boss. Hitting totems of death does heal the player with Crank. Weapons effects triggered by critical hits do not trigger by hitting indestructible decorations. Fixed bug where hitting the Slime Head’s shoulder while stomping made the boss stuck nad not attacking anymore. Fixed bug where Divine Intervetion blessing didn’t remove all curses from the player. Fixed tooltip to skip the ending cinematic which sometimes showed a wrong text. Fixed bug where entering the main menu from the intro could leave the menu zoomed in and partially out of the screen. Fixed bug where new players could get a face which was not unlocked. Added option to disable blood particles and blood stains. Added option to only show health bars when an enemy is damaged or to disable health bars completely. Added sorrowful fanfare on death. Female barbarian has specific body sprites and does not show “pecs” bubble when refusing to pick up armors.